Sorry the blog has been quiet lately, April has been a busy month. First my birthday, then Easter and then last weekend my Mom, Hannah and I went to Buffalo for a long weekend of girls shopping. Other than neglecting the blog, I've also been neglecting my cleaning which is the perfect lead-in to this post and a great giveaway! Do you do a big spring clean every year? Today my car's winter tires got put into storage. And so did my winter jacket. I love putting away all things winter, and welcoming my spring and summer items to the front of my closet. Like undertaking any big project, the big spring clean can be intimidating. I try to break it down by room and job. I do the things I prefer first (organizing what to keep and what to donate) before I do the things I less prefer (the big deep clean). I use Tide to wash our winter jackets to make sure they are clean to store - and that they smell great, ready for next year. Our new condo has ceiling fans in both of our bedrooms and our kitchen. 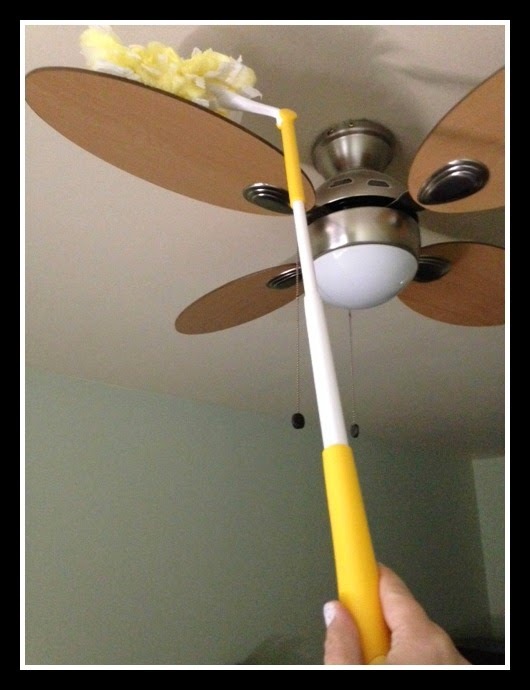 I LOVE the Swiffer 360 Duster Extender - it grabs all the dust sitting on top, and nicely wipes the bottom of the fan blades. Cleaning often includes collecting dust - which is why I need to have Puffs on hand while I clean - and sneeze. By entering the following contest you are accepting that if you win your contact information will be shared with a P&G PR and shipping agency for the purpose of mailing your prize. Please allow 4-6 weeks from the contest closure date to receive your prize. 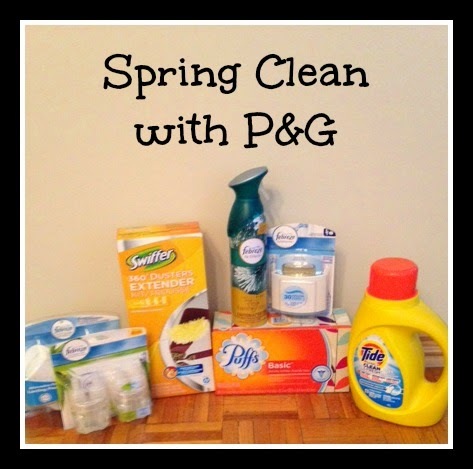 This giveaway may appear on other blogs as part of the #PGmom program. However, to be fair, you can only win once per giveaway. If your name is chosen more than once, another winner will be selected. All winners must be from within Canada excluding Quebec. Valid entries only. Contest ends April 27th, 2015. For further contest rules, refer to the Terms and Conditions within the Rafflecopter. My spring cleaning tip is to make your own glass and mirror cleaner by mixing vinegar and water together in a spray bottle. It works really well! Make a list - it makes it way more fun to clean and you're sure to clean everything you planned to! Open up the windows and air out the house and clean one room at a time. Use a mixture of vinegar and water, and a reusable clean cloth for your windows. You can keep eco friendly and your windows clean at the same time. Always dust because it's obvious in the sunlight! My tip is to open up the windows, crank the music and enjoy it - it only comes once a year! My tip is to clean one room at a time and get the family all to do it together and make a game out of it. Make a list of all the jobs to be done and cross them off as they are completed. Make a list,and mark it off as you get it done! Clean one room at a time and try to finish it before moving on to anything else. Take one room at a time to clean. Open windows. It is a good time to turn mattress and get it aired out also. I use newspaper for wiping down windows--doesn't leave a streak. Tackle one room at a time as a team. Vinegar and water do wonders. Start with one room and don't move on to another until it is finished. Clean one place at a time and always have a bag for recycling, garbage and donations! When cleaning glass instead of using a cloth or paper towels use newspaper to wipe. No streaks! Focus on one area at a time! Don't forget to clean the windows, makes a noticeable difference in any room! My best tip is to have all cleaning products in a little caddy and just start in one room until it's finished and then move to the next. I find that when I just from room to room I'm less productive and more distracted. Make a list in advance and check it off as you go. Clean one room a day so you don't get overwhelmed! I use coffee filters to clean windows..they leave a streak free clean. Put some music on - you'll get more done and move faster! I make spring cleaning fun by turning them into little workouts! My tip is to turn up the music and clean one room at a time. I like to start by cleaning the smallest rooms first, one room at a time. I know people say to do the biggest room first but i like the smaller ones so I feel some accomplishment along the way encouraging me to tackle more. I have some dance music on while I am vacuuming. have the kids help out! Do one room at a time!!! Take on one room at a time. Don't try to do it all at once, it's too overwhelming! Make sure you wash down the walls, really freshens the house! Start small, one thing at a time, otherwise it seems overwhelming. Open the windows let the fresh air in, this makes me always feel like cleaning first thing in the spring. Get the whole family to help, it goes alot faster! Take One room at a time! I do one room at a time from top to bottom. my best tip is to wash the outside of your windows with hot water and dishsoap and a squeegee. They come out sparkling. Put music in and do one area at a time. Best this is to get organized, make a plan what to do each day and have all the supplies handy. Don't try to do it all in one day or you will end up giving up. Open your windows when possible! The fresh air is great! Bailey Dexter LOL Found this one when my grandson was over...........Baby wipes, omg they clean the baseboards and scuff marks on the walls!